Every month, our Chips and Salsa of the Month Club features unique salsas and tortilla chips that are full of flavor and character. We look for the kinds of chips and salsa that are truly unique from smaller, regional producers - the kind you are not apt to find at your local grocer. So how do we find these chips and salsas? We are at the food shows and involved with the industry. We not only sample our selections, we meet the creators and listen to their stories. 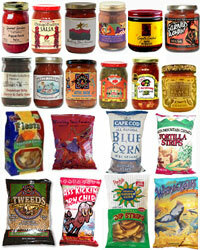 Take a look at examples of just a few of our past selections pictured to the left and you will begin to understand why we take our time to bring you the best and most unique chips and salsa to you or your gift recipient each and every month. Just looking for just salsa (no tortilla chips)? Check out our Salsa of the Month Club where we offer your choice of one or two salsas each month.